“This is madness!” I thought to myself as I frantically tried to stuff a jacket into my backpack, already bursting at the seams. Two adults, one rambunctious toddler, six months on the road, and with only a few hours till our flight, I was still trying to fit our lives into two backpacks and two small carry-ons. Whatever had possessed us to think we could go backpacking around the world with a toddler? All the inhibitions I had had, came rushing back. But so far, the hardest part hasn’t been backpacking or jetlag or the 13 hour flight with a baby; it’s been watching my two year old bid adieu to his beloved grandparents and gradually come to grips with the concept of missing home. Absolutely heart wrenching. It made me question our actions, and whether we were doing the right thing by him. My doubts however, were laid to rest over the next few days. I watched him embrace the new city, Santiago, like he’s lived in it all his life, taking to the food, people and most important in the life of a toddler, parks. And what’s not to love about this city! We’d initially allotted several days in Santiago merely as a pit stop for weaning ourselves off the 14 hour time difference with our home. What we hadn’t accounted for, is how much we would come to enjoy the city. Severely jetlagged, much of our preliminary wanderings were in the dead of the night, under halogen streetlights and amidst shuttered storefronts. Not everyone in the city was asleep though. Groups of friends hung out in the city’s many parks, their songs and laughter accompanying our walks. And much to our son’s delight, large garbage trucks trundled past, their drivers waving at him with great gusto. When our bellies rumbled with hunger and we couldn’t find a single restaurant to buy a meal from, we were saved by the nocturnal food carts that set up shop along the main avenues. These street vendors were most enterprising, converting shopping trolleys into makeshift food carts complete with portable burners. For dinner on our first night in Santiago, we stopped at one of these carts, drawn to the crowd that thronged around it and the smell of deep fried goodness. The menu was limited, so we ordered a serve of each item – greasy, but surprisingly delicious fried chicken with chips and sopaipillas (Chilean pumpkin bread), with generous helpings of salsa and other condiments. As the three of us sat on the curb tucking into our meal, my son played peek-a-boo with the vendor’s young daughter, both of them dissolving into peals of laughter. It was midnight. Set in the foot of the Andes, the city skyline is dwarfed by the mountains. A stunning sight but one that can only be appreciated in the early mornings, before the inevitable smog shrouds the view. Waking up at the crack of dawn afforded us some spectacular sunrises over the Andes. It also allowed us to explore some of the top tourist sites in relative peace. 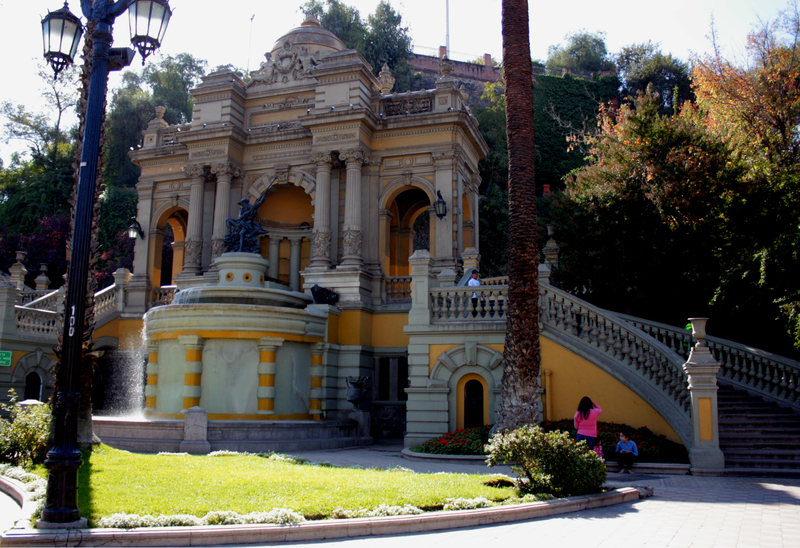 Beautifully manicured, Cerro Santa Lucia (or Santa Lucia Hill) is where the city of Santiago was founded in 1541. 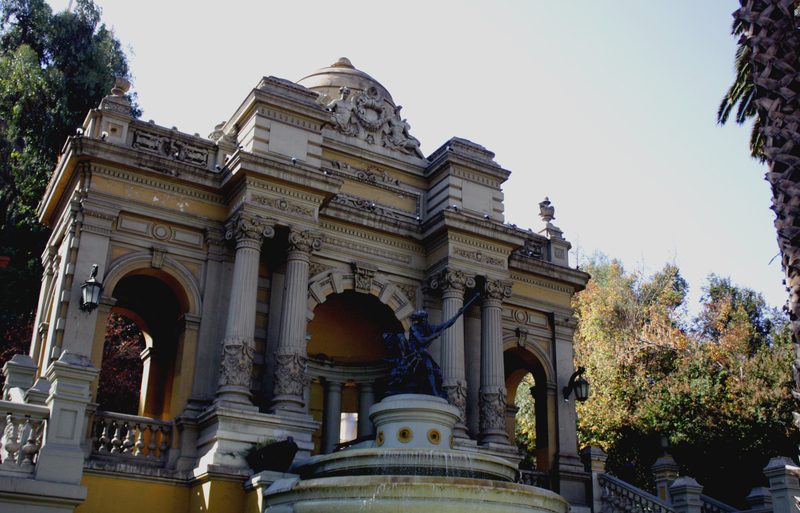 It is home to the 19th century castle, Castillo Hidalgo, and the unmissable white and yellow façade of the Alameda, a labyrinth of ornate stairs, fountains and columns. All smack, bang in the middle of a bustling city – the perfect spot to view the sunrise over the mountains, or just to take a breather from all the hustle and bustle of the metropolis. 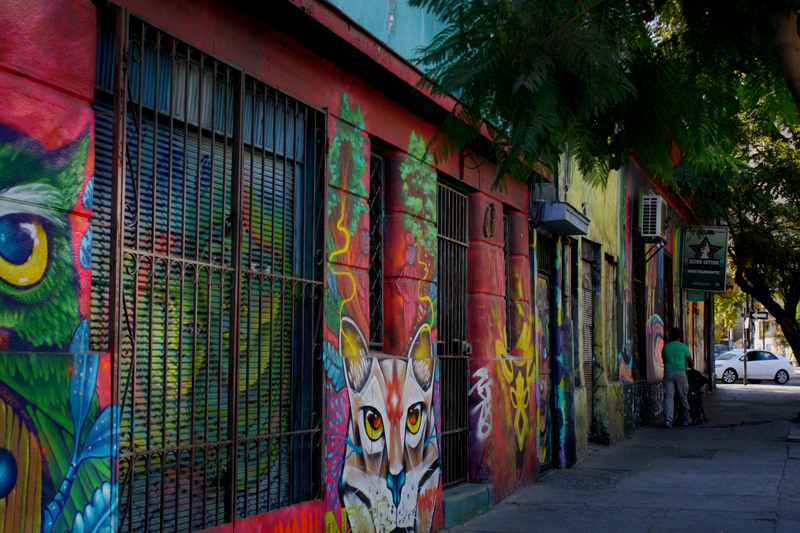 This vibrant, hipster barrio (neighbourhood) is renowned for its nightlife. However, our forays during the day did not disappoint. The bohemian Calle Pío Nono, Bellavista’s tree-lined main street, is lined with colourful buildings and bustling restaurants. 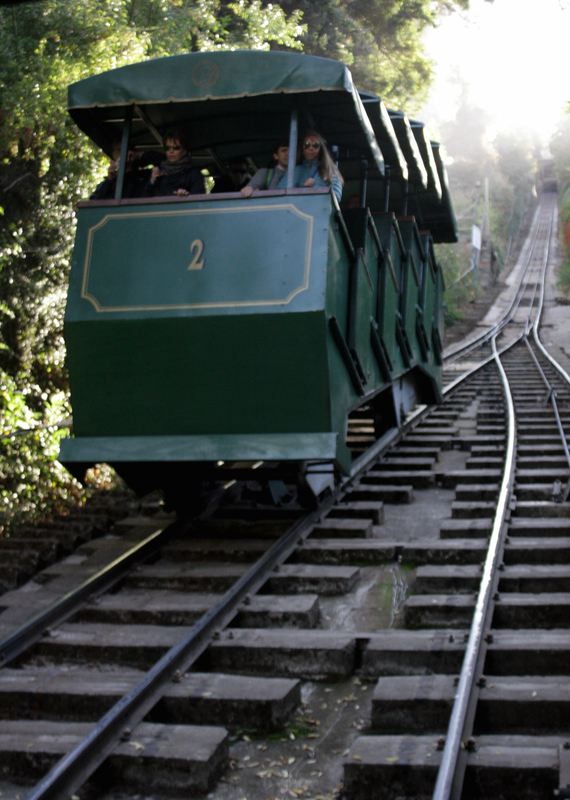 Taking opportunity of our early start, we beat the crowds and took the clattering funicular up to Cerro San Cristobal. The hill rises 300m above Santiago, according visitors panoramic views of the urban sprawl and the majestic mountains beyond. 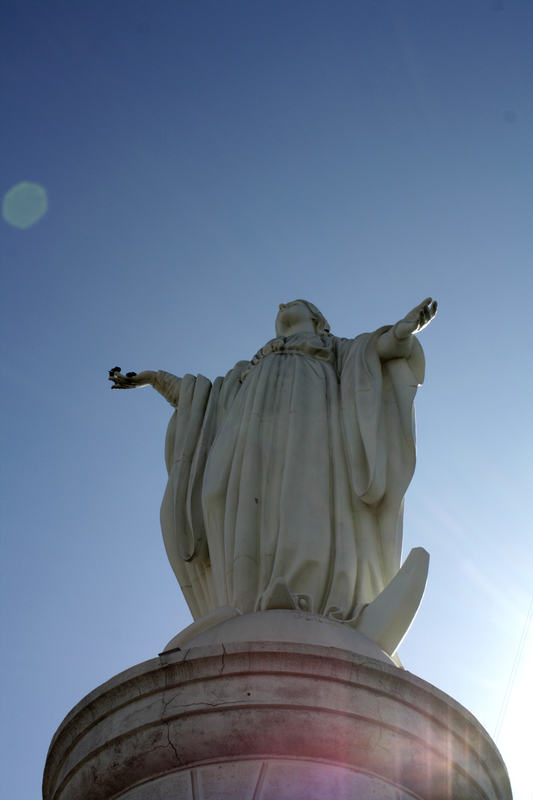 It is topped by 22m statue of the Virgin Mary. Pristine white and watching over the city, it is a scene reminiscent of Rio’s Statue of Christ the Redeemer – not what I was expecting. 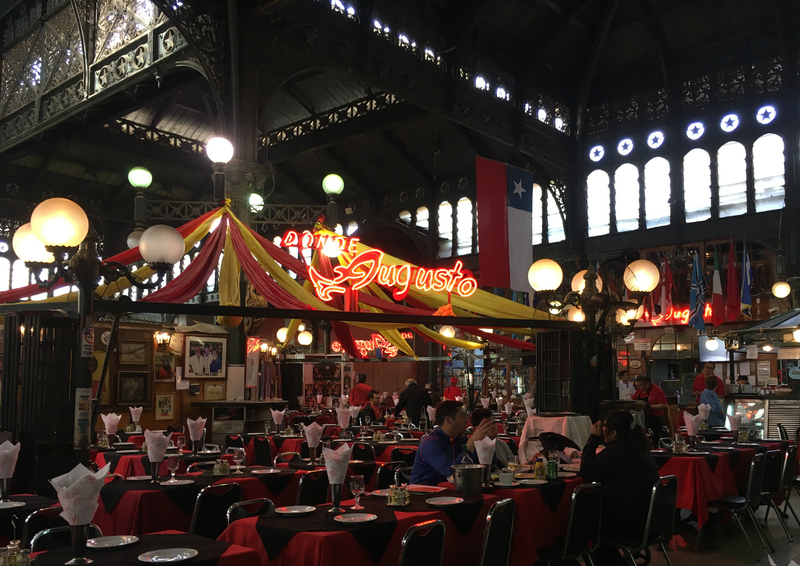 Contrary to my expectations, Santiago’s Central Market, caters mostly to tourists flocking there to take in the beautiful wrought-iron architecture, and of course, sample some of the freshest seafood. The market is lined with stalls selling their daily catch, from the familiar salmon and mussels to the alarming and repulsive-looking giant conger eels. Restaurants inside the market serve up local delicacies, however, an unfortunate number of them appear to be tourist traps. 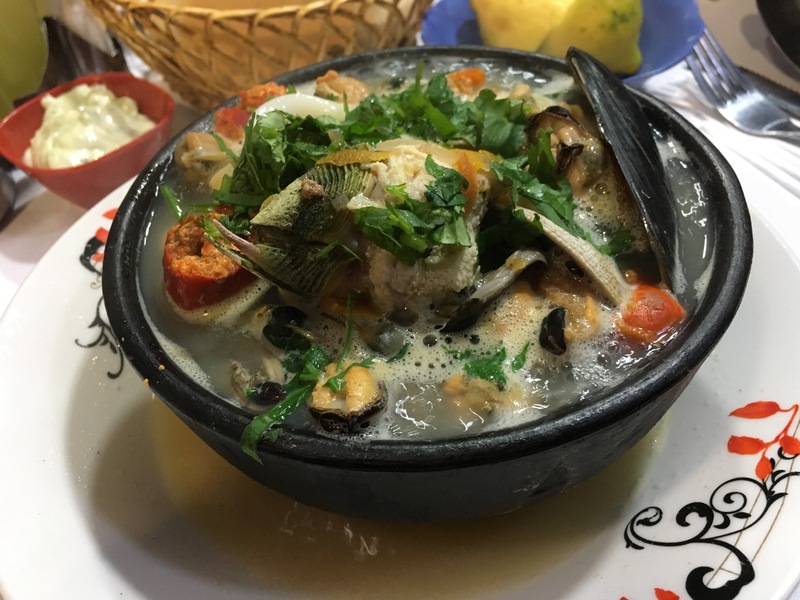 We found ourselves a little hole-in-the-wall joint, decked with battered chairs and locals tucking into their no-frills lunch and ordered a Caldillo de Mariscos, which turned out to be a small, bubbling cauldron of seafood stew with chunks of mussels, squid and conger eel. These working class neighbourhoods have a notorious reputation after dark, but are a photographer’s dream. They offer a surreal mix of cobbled streets and baroque historical buildings, with grungy graffiti. While some pockets do appear seedy and a world away from the Parisian vibe of more central neighbourhoods, but they offered a side of Santiago we would not have experienced otherwise. Although charmed by Santiago’s many faces, from the European vibes to the bohemian, we were ready to explore some more of Chile.